Italy is known all over the world for its stylish fashion industry, delicious cuisine, superb museums and galleries and iconic historic sites. 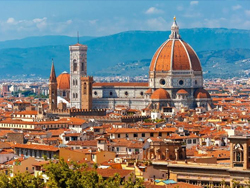 It is the birthplace of the Renaissance and the centre of the Roman Empire and it is home to the Sistine Chapel Frescos, Michelangelo’s David, da Vinci’s The Last Supper and Botticelli’s Birth of Venus. Exploring this country is like opening up a treasure chest overflowing with cultural riches. Don’t forget the food! Make sure that you wear loose fitting clothing, as you can count on filling your belly with freshly baked pizza, simple yet stunning pastas, locally made cheese, soft yet crusty breads and plenty of gorgeous Italian wine. The secret behind the great flavours is that the Italians use high quality, fresh seasonal ingredients. As well as being culturally impressive, Italy also offers a lot of beauty that was handcrafted by Mother Nature. The icy peaks and glacial lakes of the Alps, the volcanos of the South, the turquoise waters and soft sand beaches of Sardinia, the coral-rich Campanian waters… there are so many landscapes to explore all packed into a relatively small country. 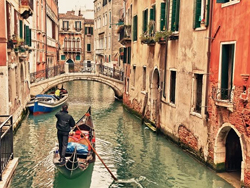 Italy has so many treasures to enjoy, so contact us today and we can plan the ultimate Italy trip for you – ensuring that you are pampered by the best accommodation and finest hospitality along the way. 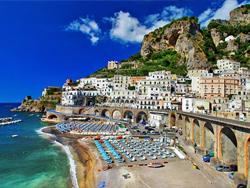 The best months of the year to visit Italy are from April to June and September to October. These shoulder seasons offer mild and pleasant weather, fewer crowds and reasonable rates. Avoid going in the peak of summer in July and August if possible, as there will be large crowds, long lines at the popular attractions and prices will be high. The weather can also be too humid and hot. 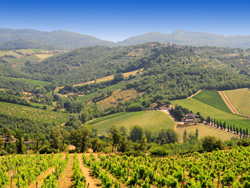 Plus, the lovely colours of the Italian landscape look their best in the spring and fall. Wildflowers will be blooming in the springtime and in the autumn the leaves will turn golden, yellow and red. The local cuisine can also be a reason to visit during the shoulder season, as the Italian diet includes a lot of seasonal fare. In spring you can enjoy young vegetables, fresh herbs, cheese and wild berries. In the fall you can savour hearty, rich, earthy flavours such as chestnuts, wild mushrooms, roasted meats and wild game. Italy is bursting with fantastic things to see and do. In Rome you can visit the dazzling Vatican Museum and get a guided tour so that you can learn all about the important pieces in the collection and the famous St. Peter’s Basilica. It’s hard to walk around in Rome without stumbling on something ancient and amazing. You can marvel at the Colosseum, admire the cobblestones of the Roman Forum and walk through the impressive ruins that were once the center of the Roman Empire. The Uffizi Gallery in Florence is another must-do for art and history enthusiasts, as it has one of the most impressive collections of Italian Renaissance art on earth. You can even head to Milan and get a ticket to see Da Vinci’s “The Last Supper,” which can only be viewed for 15 minutes at a time. In romantic Venice you can take a ride on a gondola, gliding down the canals past the historic building facades. Head to Naples and eat some of the best pizza you have ever had, as this is the place where pizza was born. If you head down to the South of Italy you can enjoy some gorgeous sunshine and visit Sardinia to lounge on some of the most beautiful beaches in Europe. See an opera in a Roman amphitheatre in the beautiful city of Verona (where Shakespeare’s Romeo and Juliet came from). Visit Pompeii to see the ruins of a Roman city frozen in time from the moment Mount Vesuvius erupted in 79AD. Seeing the site of Pompeii is impressive and if you want to see more – much of what archeologists unearthed is at the National Archeological Museum in Naples. No matter what you want to do on your adventure in Italy, we can arrange the trip of a lifetime for you. Our packages are all inclusive, so every detail is taken care of and any experience you want to have in Italy can be easily arranged – just let us know! Italy is a memer of the Schengen Agreement, which means that when you enter through any of the member states of the Schengen zone you will be able to access all over member states without going through any passport checkpoints again. If you are a citizen of the E you will only require a valid national identity card to enter Italy. Citizens of the USA, Canada, Australia, New Zealand, Malaysia, Argentina and many other countries require a valid passport to enter, but do not need a visa. You will be able to stay for 90 days in a 180 period within the entire Schengen area. Italy is quite a safe country in which to travel, like most developed countries. In an emergency you can call 112 and you will reach an operator who will connect you to the appropriate authority, whether that is the fire department, the police, etc. Be aware of tourist scams and pickpockets, as you would in any destination. The cleanliness of the food and water in Italy is high, so there is no need to take special precautions in this area. It is important to be up to date with routine immunizations before traveling to any destination. Also, depending on what you will be doing during your trip, you might want to be immunized against Hepatitis A, Hepatitis B and Rabies. Italy is part of the EMU (Economic and Monetary Union) so it shares the Euro as a currency with 12 other EU countries. Keep in mind that it is expensive to change money into Euro when you are in Italy, as the fees at the exchange bureau are high. Most businesses will accept credit cards, but your credit card company might charge you an international transaction fee. ATMs, known as Bancomat in Italy, can be found in every city and small town. Our Treasures of Italy tour experiences will offer you an experience of a lifetime. To learn more about Italy and to book one of our fantastic tour experiences, please contact us today!